The course was sticky. Really sticky. 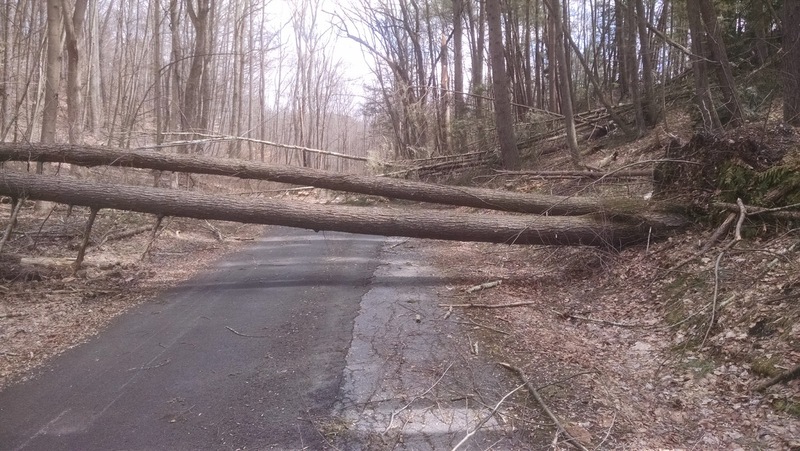 The recent high winds littered the roads with sticks, branches, boughs, trunks, whole trees, even forests almost. Although I expect most of the fallen wood will be removed by the ride date, the armies of chainsaw wielding, chipper towing arborists will leave behind many sticks. Lots of sticks. A stick stuck in the spokes will stop your steed on the spot. Look out! A really big stick blocking the road. Some of the roads are hopelessly blocked. Community Drive, specifically, is not suitable for a bike ride. There's a considerable distance covered by fallen trees that extend berm to berm. One of these might be a fun drag-over or crawl-under, but there are just too many. The DRAFT 3 cue sheet has a detour for Community Dr. It's 0.8 mi longer, but the section is downhill and passes a Turkey Hill, convenient for replenishment before the next 20 miles that have no services. 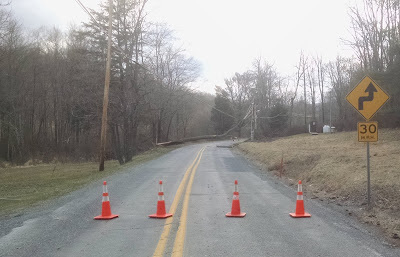 A few of the sticks blocking Community Dr.
One blockage I'm really puzzled about occurs on Cherry Valley Rd just before entering the hamlet of Delaware Water Gap. 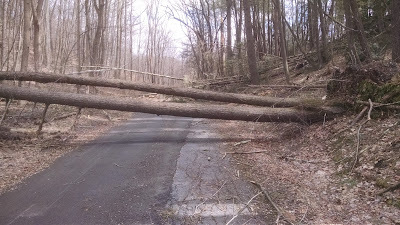 It seems this road is blocked by a pile of fallen "Road Closed" signs. 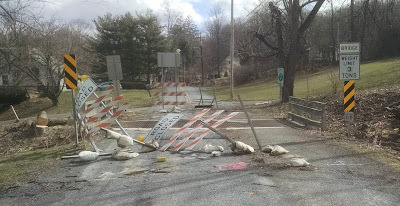 Other than these hazardous signs, it's a perfectly fine bridge and road. My suggestion is to steer cautiously around these signs, but not to read them. Road blocked by hazardous road closed signs. Other than these sticky situations, the course is wonderful. Almost all the pavement is in excellent shape, with the usual exception of the climb on Old Mine Rd into Milbrook Village. Which reminds me: there is a very nice rest room at Millbrook Village. It's just to the left of the main gate. The rest room is open 24x7, has running water, and is heated! Keep this fact in mind on the 600K. Course checkout rides are complete and the cue sheet has been updated. You will find it on the website at: http://parando.org/WaterGap300K_K_cue.pdf . Make sure you get the version noted as DRAFT 3. The route map has also been updated and has a new link: https://ridewithgps.com/routes/27177858 . As always, riders are cautioned that use of the GPS files is at your own risk. The cue sheet is the official route instruction. Registration is open. A pre-ride was conducted over Easter weekend which may require some minor course adjusting. Be sure to watch this space for any announcement regarding an updated cue sheet. Water Gap 300k Results: What Happened to Spring?